Mooniacs is Charming, Colorful, and Most of All, Fun! Mooniacs from Bad Juju and Bandai Namco delivers a nearly ideal portable gaming experience by mixing bright, colorful visuals, cute character design, and challenging, physics-based gameplay. 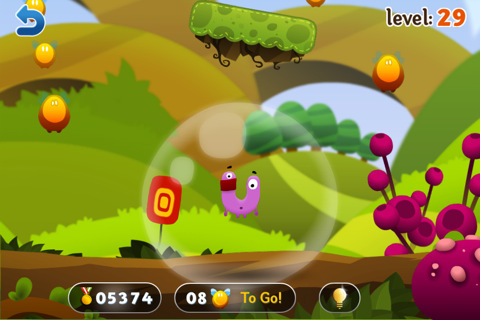 Though it doesn’t break the mold from a creative standpoint, Mooniacs has more than enough fun and charm to go around. The developers took a game concept that could have quickly become tiresome and mixed it up by adding a variety of Mooniacs, each with their own attributes, as well as different environmental elements that require strategy and forethought. At two bucks, Mooniacs is a must-buy for anyone who enjoys a quick play. 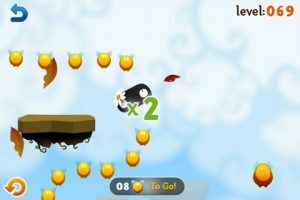 In Mooniacs, the object of the game is to fling your little Mooniac into the air, catching as many of the Juju Bees as you can. To do this, you’ll need to aim your Mooniac properly, often bouncing it off of walls, floating platforms, and other environmental obstacles in order to grab the most Juju Bees. At the end of each level, you’re given a rank, based on how many Juju Bees you caught and the time it took you to catch them. 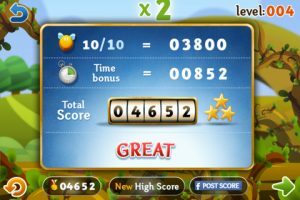 In addition, you’ll score extra points for grabbing the big Juju Bees first; which is a nice added wrinkle of strategy for those looking to get even more out of the game. As you continue your quest to collect Juju Bees and achieve the highest ranking, you’ll unlock additional Mooniacs, each with their own specifica attributes. You can even team up Mooniacs by freeing them from their bubbles, causing them to fall to the ground while collecting Juju Bees for you. While you can blow through each round, collecting only the minimum amount of Juju Bees, you’ll need to hone your skills and achieve higher rankings in order to unlock later levels. Finishing levels rewards you with one, two, or three stars, and these stars are used as currency to progress through the game. In addition, you can use the Juju Bees you collected to purchase upgrades to your Mooniacs. However, lazy gamers with money to spend can also just purchase upgrades and levels through an in-game store. While the game looks absolutely fantastic, the developers made the confusing choice of going with the widescreen, “landscape” aspect. Because Mooniacs is a vertical game, it would have been nice to be able to see the entire level without having to use your finger to scroll up and down. Because the Juju Bees are typically above the viewable area, having the screen in “portrait” mode would seem to make much more sense. 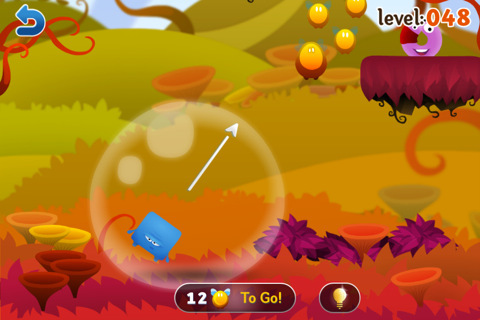 Bottom Line: Mooniacs is a wonderful pick-up-and-play game, perfect for gamers of all ages. Mooniacs is compatible with iPhone, iPod touch, and iPad. Requires iOS 3.0 or later.